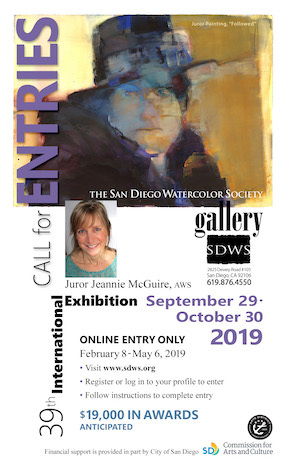 The exhibition is open to all water media artists from around the globe. Enter online Feb 8 – May 6. For more information, please View Prospectus & Information Page. This entry was posted on Tuesday, March 19th, 2019 at 5:30 pm	and is filed under Member News, Shows / Exhibitions. You can follow any responses to this entry through the RSS 2.0 feed. You can leave a response, or trackback from your own site.